Back in April, BlackBerry CEO Thorsten Heins sounded as though he finally came around to the idea that the QWERTY equipped BlackBerry Q10 would be the model that would bring out the BlackBerry faithful. The all-touch BlackBerry Z10 was launched first to stop the bleeding that was taking place in companies that allowed employees to use their personal smartphone to work. At those firms that have a BYOD policy, BlackBerry devices were being dropped in favor of touchscreen models like the Apple iPhone 5 and the Samsung Galaxy S III (now, of course, the Samsung Galaxy S4). Heins hoped that the BlackBerry faithful would decide on the Z10 instead of rival touchscreen handsets. But as Heins himself pointed out in April, longtime BlackBerry users would rather type on a physical QWERTY even if they can use a touchscreen to navigate for other functions. According to Wall Street analysts, the BlackBerry faithful are coming to the stores to buy the BlackBerry Q10. Last week, BlackBerry apologist Peter Misek over at Jefferies said that his checks of retail stores showed that the BlackBerry Q10 is being "well-received" by consumers and is making up for a slowdown in sales of the Z10. On Thursday, Societe Generale analyst Andy Perkins hiked his rating on BlackBerry's shares to Buy from Sell. Perkins sees 1 million BlackBerry Q10 units sold in the fiscal first quarter. Combined with the 4 million Z10 phones that the analyst forecasts getting rung up during the same three month period, that adds up to 5 million BlackBerry 10 units sold in the fiscal first quarter, which is ahead of Wall Street expectations that the Canadian OEM will sell 3 to 4 million BB10 handsets in the period. And the hits keep coming. On Friday, Wells Fargo analyst Maynard Um said that BlackBerry will beat sales expectations for its fiscal Q1, thanks to a good start for the BlackBerry Q10 in the U.S. Um's check of U.S. sales channels discovered high interest and strong demand for the QWERTY equipped model. 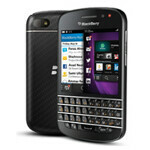 The analyst notes that the Q10 has had a more successful launch than the Z10 and expects many of the 76 million BlackBerry users to upgrade to the new model. After trading up to $14.93 on Friday, BlackBerry shares are currently at $14.40, off 2 cents on the day. Good news for Blackberry and its loyal users. I hope the trend continues. That's what Blackberry gets for holding the launch of the Q10 in the U.S so late.. idiots..
Are you sure they are BlackBerry loyalist or just blind supporters? I finally heard a story of a Blackberry user who actually needs the classic keyboard. He's a stock market floor guy who could tap out all the ticker symbols by feel without looking at the phone. He tried to switch to the Z10 and could no longer do his job. Traded it for the Q10. Just goes to show... Stick to what you're good at, Blackberry!